The Orbelle Solid Wood Bunk Bed Features a Beautifully Detailed Curved Spindle Head Board and Foot Board. 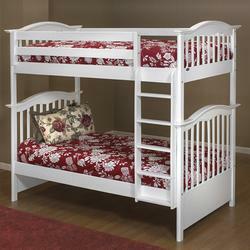 The Bunk Beds can be Easily Split into two Beautiful Twin Size Beds. This Magnificent Hand Crafted Mission-Style Bunk Beds will add Beauty and Charm to any Childs Room. The Set Includes Twin over Twin Bunk Beds. The Beds are Constructed of Solid Beech Wood. Includes ladder and One Full Length and One 3/4 Length Guard Raid. Includes Steel Bolt Re-enforcements on the Steps and Ladder. The Bunk Beds include a "Slat Support System". This is used to Support The Mattress. The use of Bunky Boards is not necessary. The Bedding and Mattresses are Not Included. All Tools are Provide for Easy Assembly. H 72" x W 42"x D 82"